was born and raised in northern California, USA. Has a bachelor’s degree in psychology from the University of California, Berkeley, and masters’ degrees in cultural anthropology from California State University, Chico, and the University of Virginia in Charlottesville, where he is a Ph.D candidate in Anthropology. Currently he lives with his wife and two daughters in Shingletown, northern California. He made three trips to Acre and Amazonas states in 2002, 2003, and 2006-7 to study the Centro de Iluminação Cristã Luz Universal–Alto Santo. 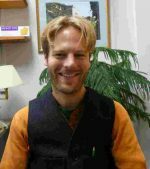 He is an associate researcher at the Interdisciplinary Group for Psychoactive Studies – NEIP. Apart from an anthropologist of the ayahuasca field, he is fluent in Portuguese, and teaches language courses at the University of Virginia. He has translated a few papers of Brazilian scholars into English, including most importantly the book “Religiões ayahuasqueiras brasileiras: um balanço bibliográfico,” published as “Ayahuasca Relgions: A Comprehensive Bibliography and Critical Essays” through the Multidisciplinary Association for Psychedelic Studies (MAPS) in 2009 and the book “Música brasileira de ayahuasca”, published as “Opening the Portals of Heaven: Brazilian Ayahuasca Music” through Lit Verlag in 2010. He also created subtitles for a two-hour DVD that documents the roundtable discussion “Panorama of Ayahuasca Research” (“Overview on Ayahuasca Research”), held on April 29, 2008 at the Federal University of Santa Catarina, in Florianopolis (Santa Catarina, Brazil) for the release of the previously mentioned book.